Two wheelers are seeing rising sales across the world. As per European Association of Motorcycle Manufacturers (ACEM), the number of motorcycles registered in the EU was 830,694 units in the first nine months of 2018. Asia Pacific is witnessing increasing sale of two wheelers especially in India which has emerged as the largest two wheeler market in the world. According to Society of Indian Automobile Manufacturers (SIAM), the domestic sale of two wheelers in India has increased from 1,37,97,185 in 2012-13 to 2,01,92,672 in 2017-18, at a CAGR of 7.9%. In the U.S., as per Insurance Institute for Highway Safety (IIHS), the number of motorcycles registered has increased from 8,047,435 in 2012 to 8,392,682 in 2017, increasing at a CAGR of less than 1%. Thus, across the world, rise in motorcycle sales is increasing the demand for motorcycle protection gear. A rise in demand for superbikes is also seen across the world. In Asia Pacific, especially in India, demand for superbikes is increasing in double digits. SIAM figures indicate that in India, demand for superbikes (above 150 cc) increased from 488,816 in FY13 to 1,438,373 in FY 17,risingat a CAGR of 31.0%. In the superbike segment, demand for superbikes in the range of 250 cc – 350 cc increased from 108,478 in FY13 to 605,676 in FY 17 at a CAGR of 53.7%. Global premium two wheeler manufacturers such as Harley Davidson, Triumph Motorcycles, Suzuki Motorcycles, Kawasaki, etc. have entered the India market. Demand for superbikes is inelastic to price and cost inflation in India. Consumers owning superbikes increasingly prefer branded driving protection gear products. India is already the largest two wheeler market in the world. Opportunity for growth of superbikes in India is expected to create good opportunity for driving protection gear manufacturers. The study provides a conclusive view of the global driving protection gear market by segmenting it in terms of product type, material type, vehicle type, consumer group, and distribution channel. In terms of product type, the driving protection gear markethas been classified intohelmet, armor, gloves, knee protection, elbow protection, and others. The others category includes driving goggles, kidney belt, etc. Based on material type, the market has been segmented into leather, synthetic, and natural fibers. In terms of vehicle type, the market is segmented into two wheelers and four wheelers. Based on consumer group, the market is classified into men and women and in terms of distribution channel, the market is segmented into online and offline. In the Asia Pacific region, sports bike racing is increasingly becoming popular. Asia Road Racing Championship (ARRC), which is approved by International Motorcycling Federation (FIM), is expected to launch a new 1000 cc superbike, ADB1000 race in March 2019. ARRC intends to launch the new superbike race due to increasing interest in powerful motorbikes racing in the region. The Asia Pacific motorbike racing market is growing at a fast rate. ARRC also intends to unite the different motorcycle races in the region so as to produce world class motorbike riders who can compete in global motorcycle racing events. In 2019, ARRC will have four categories of races involving superbikes of various categories: Underbone150cc, Asia Production 250cc, SuperSports 600cc, and ASB1000. All these races are expected to create increasing demand for superbikes in Asia Pacific, which is expected to offer good opportunity for driving protection gear manufacturers. Two-wheeler ownership is increasing across the world. In developed regions, motorcycle ownership is increasing among women. According to the latest survey conducted by Motorcycle Industry Council (MIC), one in five motorcycle owners is a women, compared to one in 10 a decade ago. Motorcycle ownership among women has climbed from 10% in 2009 to 14.0% in 2014 to 19.0% in 2018. The MCI survey observes that two-wheeler ownership among women is more in the younger generation. This report on the global driving protection gear market provides analysis for the period 2016–2026, wherein 2017 is the base year and the period from 2018 till 2026 is the forecast period. Data for 2016 has been included as historical information. The report covers market dynamics including drivers, restraints, opportunities, and trends that are expected to influence the expansion of the global driving protection gear market during the said period. The study provides a comprehensive analysis on market growth throughout the above forecast period in terms of value estimates (US$ Mn) and volume estimates (‘000 Units) across different geographies. Across the world there is rise in two wheeler death rates. This has increased the usage of two wheeler and motor cycle helmets. According to the Global Status Report on Road Safety, 2018 by WHO (World Health Organization), in the top ten countries having the largest number of two and three wheelers, motorcycles comprise above 70.0% of national vehicle fleet. As per WHO, correct helmet usage can lead to 42.0% reduction in the risk of fatal injuries and 69.0% reduction in the risk of head injuries. In 2017, in the U.S., the market share of motorcycles was only 3.0% of the total U.S. registered vehicles, but the share of traffic fatalities involving motorcycles have remained consistent from 14.0% in 2008 to 14.0% in 2017. Thus, motorcycle helmets are the most important safety product for a motorcycle rider. This is driving the demand for two wheeler helmets across the world. The study provides a conclusive view of the global driving protection gear market by segmenting it in terms of product type, material type, vehicle type, consumer group, and distribution channel. In terms of product type, the driving protection gear market has been classified into helmet, armor, gloves, knee protection, elbow protection, and others. The others category includes driving goggles, kidney belt, etc. Based on material type, the market has been segmented into leather, synthetic, and natural fibers. Based on vehicle type, the market is segmented into two wheelers and four wheelers.Based on consumer group, the market is classified into men and women and in terms of distribution channel, the market is segmented into online and offline. The analysis of the above segments is based on present and forecasted global demand for driving protection gear products and prevailing and future trends in the market. We have analyzed the present and estimated regional market size of driving protection gear products across North America, Europe, Asia Pacific, Middle East & Africa, and South America. The regional driving protection gear markets are further broken down into country level markets in the following geographies: the U.S., Canada, U.K., Germany, France, Italy, Spain, China, India, Japan, and Brazil. The global driving protection gear market consists of global players as well as large number of medium and small players. The report includes detailed analysis of the global driving protection gear market, SWOT (Strength, Weakness, Opportunity, and Threat) analysis of the market, Porter’s Five Force analysis, and key macroeconomic indicators influencing the market, driving protection gear regulations in various geographies, and consumer behavior. The industry analysis includes value chain analysis of the global driving protection gearmarket. 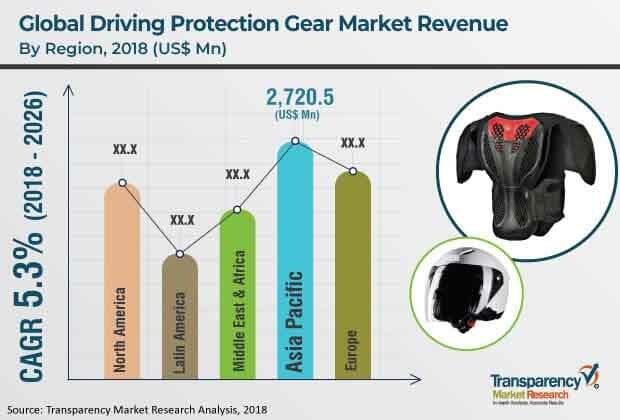 The report highlights major companies operating in the global driving protection gear market including Alpinestars S.p.A, Dainese S.p.A, Fox Head Inc., SCOTT Sports SA, Lemans Corporation, Sparco S.p.A,Leatt Corporation, EVS Sports, Troy Lee Designs, and OMP Racing S.p.A. These market players have been profiled in terms of attributes such as description of the company, financials (if available in the public domain),products, key strategies to increase market share, and recent developments in the driving protection gearmarket.